The Flagler Youth Orchestra continues to successfully provide music education to the children of Flagler County. With the support of the Flagler County School District, we served more than 375 students last year. Right off the bat, we are responsible for raising $19,000.00 to cover our portion of instructional costs, including the addition of a part time fifth teacher. But there are other significant needs beyond this amount including funds for instrument scholarships and maintenance of those instruments, our music library, and supplemental learning and performance opportunities. We need our community’s support so that we can continue our educational work and provide opportunities to students whose families are unable to afford the expense of an instrument. Here’s how you can help! Support the mission of the Flagler Youth Orchestra with your concert program advertiser sponsorship. For as little as $35 a concert, you can reach a captive audience of engaged parents and patrons of the arts. The advertising form can be found here. Be a sponsor for the year, and get a discount rate. Half page advertisers (or larger) will receive two complimentary tickets to the event(s) they sponsor. You can purchase the season online below. You are probably already aware of the educational value of what the FYO offers to your child and our community. 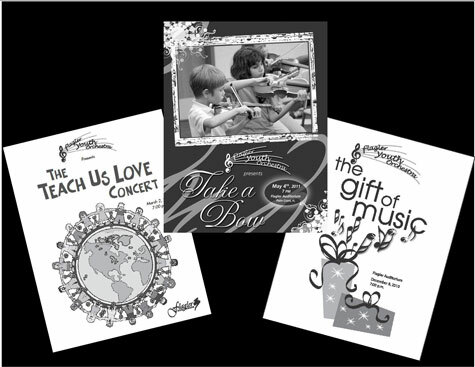 The concert programs are beautiful keepsakes, so why not include a personal message to your child? Not only are our love notes, well wisher messages and business size ads a great way to show your support of the FYO, but they’re an excellent way to personalize the printed program for your child. If you sponsor the concert with a business card size ad or larger, you can include a picture of your child in the ad space. The forms for ordering these advertisements can be found here: love notes, hand-written well wisher messages and business advertisement order form. Stop by the green room to see samples of programs from previous years. They are gorgeous! The Flagler Youth Orchestra receives 100% of paid personalized messages and advertisements on the inside pages of the program. Each concert has it’s own unique program and we distribute at least 525 copies at each event. Patrons love to look at the advertisements while they wait for the concert to begin. Support the FYO with your sponsored advertisement or personal message. Our families won’t forget the support you showed for a program that educates their children. For more information, please call Cheryl at (386) 503-3808. Or visit Ms. Cheryl or Ms. Anna in the Green Room during string classes.